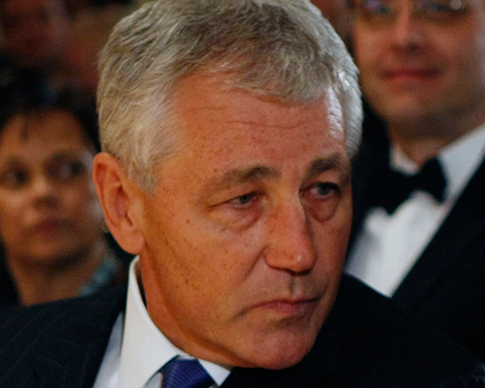 Former Nebraska Sen. Chuck Hagel has retracted homophobic comments he made 14 years as his hopes to be nominated and confirmed as Secretary of Defense appear to be fading. The anti-gay comments, first reported by Buzzfeed, were made in opposition to President Clinton’s 1998 nomination of an openly gay man to serve as ambassador to Luxembourg. Hagel told the Omaha World-Herald at the time, "Ambassadorial posts are sensitive…They are representing our lifestyle, our values, our standards. And I think it is an inhibiting factor to be gay — openly aggressively gay like Mr. Hormel — to do an effective job." Today Hagel said, "My comments 14 years ago in 1998 were insensitive. They do not reflect my views or the totality of my public record, and I apologize to Ambassador Hormel and any LGBT Americans who may question my commitment to their civil rights. I am fully supportive of ‘open service’ and committed to LGBT military families." It is not clear whether the apology will quell the outrage from gay-rights groups. However, Hagel made no mention of the other statements that have been dogging his potential nomination for weeks, including comments about efforts by the "Jewish lobby" to "intimidate" members of Congress, or his Iran record, which critics say makes him unfit for the post. While numerous Senators have expressed concern about a possible Hagel nomination, Sen. John Cornyn (R., Texas) today became the first Republican to say he would oppose the nomination. Moreover, Democratic Rep. Barney Frank (Mass. ), an openly gay member of Congress who is considered a likely pick to fill Sen. John Kerry’s seat if he is confirmed as Secretary of State. Frank said yesterday that Hagel’s anti-gay comments were a "disqualification from being appointed." This entry was posted in Politics and tagged Chuck Hagel, Video. Bookmark the permalink.